The Medicine Programme, offered by the Cambridge Summer Institute, is designed for students currently studying medicine or professionals in the Healthcare field. The programme offers its participants the opportunity to attend lectures and workshops delivered by esteemed Professionals and Academics in the field of Medicine. There are a number of courses available within the programme each targeted toward students with differing levels of experience. Discovery Level: These courses are targeted towards students in the first or second year of their medical education. The lectures will introduce delegates to new concepts, practices and principles in medicine. Exploratory Level: These courses are targeted towards students who have already completed a number of years of medical education and are looking to deepen their existing knowledge and explore alternative perspectives and approaches. Delegates will select one course per week. Please note that topics and courses are subject to change. 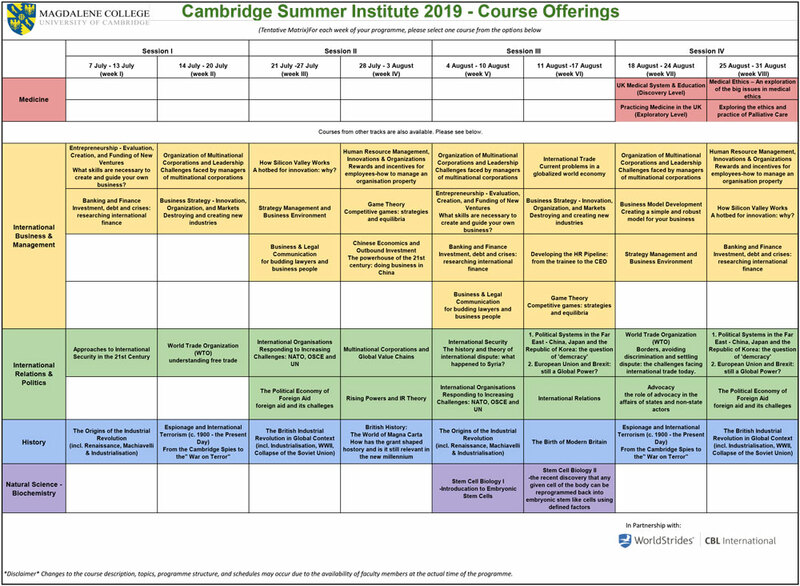 There is also the opportunity to combine the Cambridge Summer Institute with its sister-programme, the Summer Institute at Oriel College, University of Oxford. Delegates may complement their Medicine programme in Cambridge Session IV by attending Oxford Session III (29 July – 11 August 2018) to study courses in ‘Global Health Challenges in Economics’, ‘Contemporary PPE – Ethics & Logic’, ‘Medical Law & Ethics’. These courses are Medicine-related and delegates may explore the Law and Economics behind the practice of medicine. Moreover, we offer a Professional Skills track including ‘Research Methodology‘, ‘Intercultural Communication‘ and ‘Business & Legal Communication’. As such, delegates will have the opportunity to experience another part of the UK while studying in a prestigious constituent college of the University of Oxford. Length Medicine courses take place between 18 August and 31 August 2019, with differing levels on offer. Please note if you select the Medicine track, you can only select courses from this track. Fees Please see our Fees & Tuition. Prerequisites This is an open enrolment course. We recommend that applicants have prior knowledge or strong interest in the subject/course they are enrolling in. Additional Information In addition to lectures given, this course also includes various extra-curricular activities such as social events & leisure activities and excursions to famous places and historical landmarks. Learn more about Programme Information. During this course, delegates will explore the UK Health System with a focus on the National Health Service as it celebrates its 70th birthday. Comparisons will be drawn to other health systems around the world. This course targeted toward experienced medical students and professionals, takes a deeper look at the practice of medicine in the UK. Delegates will explore the strengths and weaknesses of the National Health Service and how it copes with the various challenges it faces in the modern world. There will also be an opportunity to practise clinical skills such as Patient History Taking & Physical examination. Clinical Skills – Patient History Taking & Physical Examination in English. The study of Medical Ethics is a crucial part of medical education. This course gives delegates the opportunity to explore the big issues in medical ethics and the similarities and differences between attitudes and practices in the UK and other countries and cultures. ‘A Health Service for All’ – Care and Treatment for Sexual, Cultural and Religious Minorities. Caring for those facing the end of their life is challenging for the most seasoned medical practitioners. This course will explore the principles and practice of palliative care in the UK while considering some of the ethical questions surrounding the palliative approach. Introduction to end of life care, specialist palliative care and the history of the hospice movement in the UK. Contemporary attitudes towards death and dying in the UK. Comparison with attitudes in other cultures and countries. Exploration of Opioids, adjuvant medications and holistic approaches. 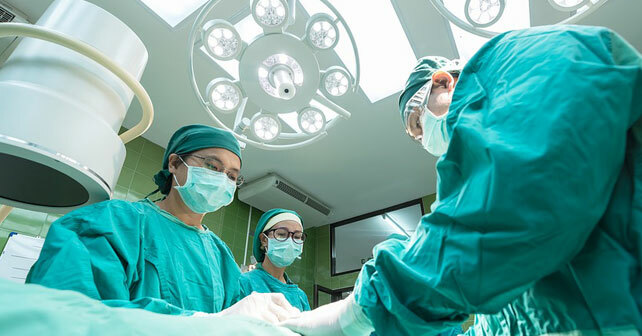 This course provides an introduction to important topics in UK medical law including consent, negligence, reproductive medicine and end-of-life decision-making. It will also consider ethical issues raised by each of these areas, and evaluate whether the law currently takes the correct approach to them, or whether the law ought to be reformed. Delegates will engage in discussion and debate on the ethical problems that arise, and how the law ought best to accommodation these. The Economics of Big Health Challenges: This course will discuss and analyse the state of health in the world and the challenges of the next 20-50 years. In addition, delegates will learn how health financing will need to adapt to the challenges of an aging population. Case studies analysing pandemics, such as SARS, flu, and Ebola, will be looked at in detail to understand how these cross over into the financial market, looking at early warning, and response ideas. Since its beginnings in ancient Greece, the Western philosophical reflection on how we should conduct our lives has been closely intertwined with the inquiry into logos, ‘reason’ or ‘reason-ing’, practical and theoretical, human or divine. While ethics and logic have developed into two distinct disciplines, different philosophical approaches to normative ethics and meta-ethics are often best understood as springing forth from different conceptions of the role that reason and argument (ought to) play in human morality, and from different assessments of the validity of certain key arguments (or alleged ‘fallacies’) in ethics, and of the force and implications of certain ‘dilemmas’ or ‘paradoxes’. Competing ethical theories are typically construed dialectically: they argue for the deficiency of the rival theories, and defend themselves by denouncing the shortcomings in the logic of their attackers. This course will look at key academic and practical topics involved in intercultural communication. Drawing on the fields of literary studies, linguistics, anthropology, ethnography, and cultural studies, delegates will analyse topics including, ‘Communicating between cultures’, ‘Translation’, ‘Verbal and Non-verbal Communication’, and ‘Cultures and Concepts’. Students will acquire practical skills, including how to interpret essay questions, how to structure and reference an academic essay, as well as how to write with clarity, brevity and maximum impact. Significantly, delegates will acquire academic guidance on how to productively conduct research for an academic or professional essay/thesis/dissertation/report. This course is designed to develop an individual’s confidence and ability to use English within a professional environment. Covering topics such as negotiation, business presentations, client communication, and self-communication, this course is an excellent preparation for future experience in the business or legal sectors of an English-speaking environment both with clients and about focus on the reading, writing, and listening skills of the English language in a business context. By being able to understand and use the business language, participants will be able to further their career in both their work quality and building relationships among colleagues and clients. This course will provide delegates the ability to communicate on an international level using precise and correct legal language. Upon completion of the course, participants will improve their confidence in explaining points of law, enhance their drafting and editing skills, and ultimately represent their organisation in a more effective manner. If you have additional questions, contact our Academic Advisors at apply@cambridgesummerinstitute.com or call them at +44 (0) 1865 616 726. They will gladly guide you through your various options and assist with your booking.